Description: Indigo CollarTags™ are high quality ID tags which thread onto a collar. They are made from extremely hard, non-magnetic stainless steel. Suitable for use on agility dogs. There are two main types of dog tag - one that just slides on (buckle type collar) and the other where attach to the dog collar (adjustable collar/clip on). Both were very easy to put on. I put them onto my youngest two dogs who are always playing and pulling each other around and they lose quite a few dog discs between them. These tags have lasted very well so far, and with the rule now allowing dogs to work in their collars (no dangly bits) these dog tags are ideal. Jill: This tag is for life! It comes with a 'for life', so if it breaks, becomes illegible (unlikely, as the engraving is quite deep), or fails in any way then it will be replaced free of charge. I wanted to give the Mini Collar Tag a go because when, in the past, I had tried the smallest size of slide-on tags from other suppliers on my small dogs, I had found that they didn't fit very well. The curved shape of the Adjustable CollarTag™, however, ensures an excellent, snug fit against the neck of even very small dogs, which must make it a lot more comfortable for the dog. The tag has stayed solidly in place at all times. On an adjustable snap buckle collar, the Adjustable CollarTag™ can be fitted to the top layer where the webbing is doubled, leaving a layer of webbing between the edges of the tag and the dogs neck. This should reduce the risk of the tag rubbing against the dog's skin or the shanks becoming tangled in long, silky coats. Anyone who feels that fitting an Adjustable CollarTag™ may be too fiddly (e.g. due to arthritic hands etc.) can order pre-fitted tag-and-collar combinations from the supplier. The tags are very solid yet clear to read and close fitting to the collar. My three dogs have not been able to dislodge them as they galloped across Exmoor been swimming, rolled in mud and the cocker has given his a good dragging through gorse cover. They were always losing them before in the undergrowth. When we had a diabetic dog this sort of fitted tag would have been ideal. The tag doesn’t have any – it's not glamorous, but it is functional. If I was picky, the only thing I would say is that some of the photos of tags had the dogs name at the top, which I was always taught is a no-no as, although this is a personal preference. I would have also found a little advice on the actual law regarding collar and identification on dogs useful. The Control of Dogs Order 1992 t is on the front/home page of the web site but they could put something with the instructions. While we all like to think we know the answer, if you’ve ever done KC Good Citizen classes, then you’ll know it isn’t always the case! The Mini Adjustable CollarTag™ is not suitable for leather collars. Unfortunately, the Double Thickness CollarTag, which is suitable for leather collars, is only available in Medium and Large sizes. Small dogs and puppies like to wear leather collars, too! Restrictions on the amount of text on Mini CollarTags™ (4 lines, 14 characters per line). Anyone who wants to include a mobile phone number will have to think carefully about what text to put on the other three lines. More space for text on Small, Medium and Large tags (5 lines, 14-25 characters per line). Clive Did not find anything. Kerstin Clear, easy-to-read engraving. Unlike brass tags, there should be very little risk of stainless steel tags staining the coats of light-coloured dogs. Jill Packaging (tapes to a card) looks cheap and cheerful, but actually read it and it comes across as friendly and helpful. Personally, I would have liked a few more pictures of dogs wearing the tags on the website though! Peggy Came in post in small jiffy bag. Kerstin The tag arrived taped to a laminated instruction card. It was easy to detach and use. There were sensible instructions, both on website and on the enclosed card. Again, I thought the instructions were excellent, even advising you to keep your guarantee with your doggy documents so you could find it. Peggy I asked for the type to go over clip on agility collars and they went on much easier than I thought they would. Clive Very easy and straight forward to order on line. The delivery was within the timescale (10 days) quoted. Jill I found it very straightforward. Wish our online booking system was as easy and user friendly! Peggy Easy to order from web site. There is an option to pay by PayPal or use the Pay by Cheque facility, an easy alternative for people who don't like to use credit cards on-line. Confirmation of order came by return of email and order arrived in a week. Kerstin Excellent company website with detailed and accurate information, including the number of lines and characters for each size of tag. Straightforward ordering procedure. There should be no need to contact the supplier for further clarification before placing an order. Kerstin After a week of use, I would say that it is a fair price. The supplier guarantees that the text will not wear off, so provided the tag isn't lost, it should last your dog for life. Jill: Excellent – this might be more than you would normally pay for a tag, but its worth it. Having bought tags before for maybe half the price, and had the engraving fade out, it's worth a little extra to get on that will last. Clive Will be buying more. Jill 9/10 - for the life time guarantee, speed of return and general friendliness that the company manages to put over via website and card included in order. I thought this was an excellent idea, and would be particularly useful for people whose dogs have a medical condition that they need people to be aware of, as anything can be engraved on it, or for a competing dog that runs in a flat collar. Kerstin 9/10 due to the loss of one line of text on the Mini CollarTags™ compared with other models. If Indigo Collar Tags starts supplying Mini and Small double thickness tags, I'll give the company 11 out of 10. Peggy I was very pleased with tags and the way they stay put on the collars I already had. Would be ideal as a medical alert tag as a lot of detail can go on tag or more than one worn. Indigo Collartags™ was started after a long and frustrating search for a secure ID tag to attach to his very active Labradors. 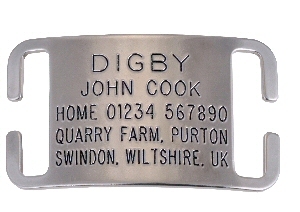 For years, John Cook had been buying the conventional round brass tags that were routinely ripped from their collars and left in hedges as they chased rabbits on his farm. It was very obvious that these tags weren't strong enough for the job, but there didn't seem to be any better alternatives. Then came the day when the dogs went out hunting on their own. They ended up going off the farm, and only one came back. John found out very quickly where the other one was. She had been picked up by the dog warden, and despite the fact that she is microchipped, she spent the night at the dog pound. The search for a new method of identification for my dogs began in earnest, and finally he found 'CollarTags'™. These tags are quite unlike anything he had come across before. They are deeply engraved, very strong and stay securely on their collars whatever they get up to. John has secured the exclusive distribution rights to the European market for 'CollarTags'™, and aims to spread the word about a better alternative in pet identification. He now feels confident that he is keeping his pets safe with a tag that won't fall off or become unreadable. Clive Hildersley has been involved with agilty for 15 years now and has been judging for ten years. His wife Fran and their two children George and Morgan also do agility. 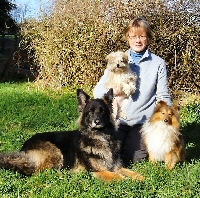 The family belongs to Roseland DTC in Cornwall where Clive and Fran are two of the trainers. Clive works as a planning officer for Openreach, part of BT Group. Kerstin McDonagh has owned dogs from age 11, when she saved her pocket money to buy a Border Terrier. Since then, she has lived with and worked a wide variety of breeds, including Labrador, poodle, WSD, GSD, Sheltie and, most recently, a Lowchen. Born in Sweden, she spent her summer holidays working in dog rescue kennels and breed kennels in Sweden and on the Continent. After several years handling dogs in the obedience and show rings, she entered into the addictive world of agility after moving to Britain in 1989. When escaping from her day-job as a translator, she likes to compete in obedience, agility, working trials and on the British breed show circuit, usually with the same dog performing in several different disciplines. Kerstin now lives in south-west Scotland with her husband, three dogs, nine hens and two feral cats. Peggy didn’t think that she stood a chance as she had had a badly broken leg and couldn’t run but after a string of seventh and eighth places, she won two Starters classes in a fortnight. She trained at Thames until moving to the edge of Exmoor 2 ½ years ago. She's had a couple of years away from training since moving, but now has a Working Cocker pup which she hopes will work away from her and do Medium classes. Jill Spurr has been training in agility about 11 or 12 years now, starting off as doing it just to keep WSD Tess occupied with no intention of ever competing! Tess is now 14 and still gracing the veterans classes, and Jill now judges and runs Rebels 2000 agility section in the heart of the Chilterns countryside with partner Mike Douglas and friend Linda Mead. She currently has two competing collies: Bryn, an eight year old red Valgray rescue and Matisse, her four year old gorgeous red merle! She is also currently play training puppy Dali, a lilac BC. Jill and Mike are both proud to train at Upanova Tigers AC with Alan and Jayne Bray. In addition to agility, Jill and Matisse also compete in Obedience. 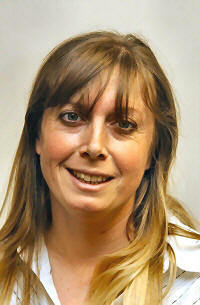 Jill has worked in local newspapers since 1999, where she currently is New Media Manager.